This section will describe how to use the data.table package. This package is a much faster implementation of the data.frame object which it also extends. A data.table is a collection of vectors of identical length. Each vector forms a column, and so the data.table can be thought of as a table with a number of row and a number of columns. # same as using the j-argument, the list index or the the list name? the first argument allows to subset the data, the second allows to perform function on that subset, the third argument allows to apply the function by groups. TBD. Here we show how the keys optins can be used to compute lag variables in a data.table. This requires that you understood the way data.table works. Let's first generate the data in a very crude and slow way. Now that we have our data set we can create the first difference to remove the fixed effect. To do so we are going to use the keys of data.table. We first define the keys for the table. The keys should uniquely identify a row in the data. In our case (i,t) is enough. The J function creates a data.table with the 2 columns i,j coming from the wrapping data.table. It creates a running index that will go through the table. Then we can use -1 to express that we want to shift this index by one. Any transformation can be performed at this point and one can go 4 periods before or after or anything. 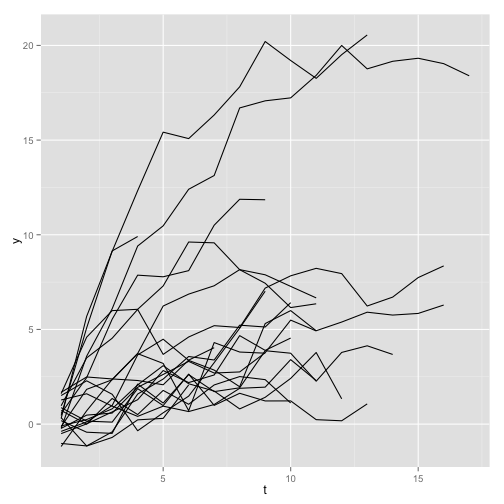 You can see that this already produces the desired result: the value of y.